The start of the run back to Marrakesh is a fairly straightforward drive, the road cutting through an impressively barren stretch of stony desert on its way to the oasis of N’Kob. After returning from your night in the Sahara (and probably also after a quick hot shower to warm you up again), retrace your steps to Rissani but then follow the N12 due west rather than heading back up towards Erfoud. Alnif, 130km from Merzouga, is famous for its fossils, and you’ll probably have to dodge the boys who come running out into the road here, clutching little trilobite necklaces for sale. At Tazzarine, 65km further on, you’ll need to turn right onto the R108, after which it’s just 35km to N’KOB. 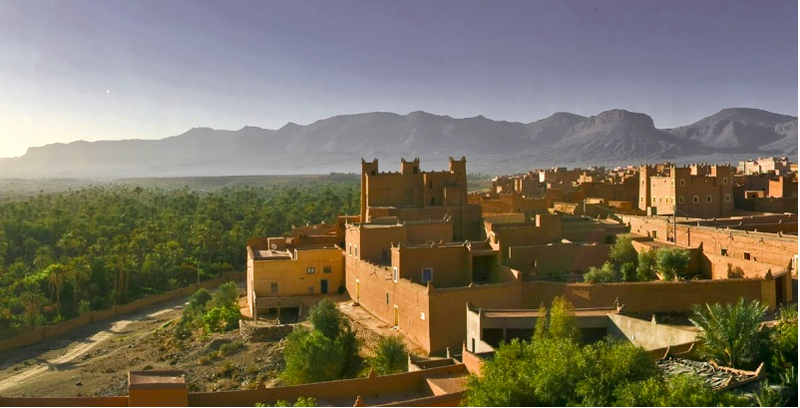 The village is the largest ksar in Morocco and is a pleasant place to break your journey, its kasbahs enjoying fantastic views down over a palmery and across to the Jebel Saghro mountains.